A recurring theme I see in the discussion section at Violinist.com is the issue of how to play without a shoulder rest and without the shoulder coming into contact with the back of the instrument. I started in a Suzuki class at the age of six, and at least at the time, everyone was taught to hold the instrument exclusively between the head and shoulder--- and be able to drop the left arm. When I began studying with Emanuel Vardi at the age of twelve, he was strongly against this and asked me to remove the shoulder rest. Though every five years I try one out (and quickly put it back in the drawer) I haven't used one since. Mr. Vardi didn't believe generally that the shoulder should come into contact with the back of the instrument, though he didn't offer me too many details on how to accomplish that, and at times I struggled. There were times in the more difficult repertoire that I simply played with the shoulder supporting the instrument, and I actually never felt there was much wrong with that. Look at the miracles Eugene Fodor accomplished playing that way! Or so many of today's soloists who use shoulder rests. It certainly works. However I think there are some benefits to holding the instrument above the shoulder, too, and as I see there is interest on the part of some in doing that, below are a few ideas that I hope may help. In addition to having worked on this with some students, I also asked my wife Tanya--- who loves her shoulder rest--- to try all of this out to get her impressions. Position: The instrument sits on the collarbone (at times held in place from above by either the chin or jawbone.) At the other end and without vibrato, the neck is lightly held on the sides, between the lower part of the thumb and the base of the index finger. When vibrato is added, the hold turns more toward a top-to-bottom proposition; Often the thumb will stick out like a hitchhiker's thumb, and whichever finger is vibrating on the fingerboard above will provide downward pressure onto the lower part of the thumb. This will allow the index finger to lose contact with the side of the scroll in order to vibrate freely. Tanya definitely didn't like the feeling of the instrument on her bare collarbone and recommends material (clothing) to cover the clavicle. I think after years of playing, my collarbone is numb to it! If you keep your scroll higher (level with your nose), it will bring the center of balance of the instrument closer toward you, which is an advantage especially in downward shifts. Also, it might help if you have your chin more in the middle (more on the tailpiece than in the chinrest) especially if you're playing a really large viola. Many people find leaning on the left leg a little helps with general balance. At the moment of the shift, the head should be in contact with the instrument to prevent it from moving. If the left hand is moving in the right way, very minimal head pressure is needed to keep the instrument in place. If the left hand isn't moving the right way for this experiment, all the head pressure in the world won't keep it in place! (also see below about instrument set up, which can also get in the way.) In some cases, it helps if the thumb can start in the same position as it will end. Your thumb can't always behave in the same way as with a rest, as it plays more of a role. (Rests often allow for a lower thumb position.) Often I let the neck fall onto the bone at the bottom of the thumb for a long slide, however for a really high leap where the high note can only be reached with the *end* of the thumb touching the heel of the instrument, I will start that way in the lower position; i.e. with only the tip of the thumb touching the scroll. To repeat, contact must be kept the entire way, and it will be a slower shift than you're used to. Some instruments have some kind of shellac on the neck. You can see the wood, but it's shiny. When your hand warms up, the shellac can get sticky and not allow your thumb to move easily. It's not needed on the neck (many instruments don't have it), and you won't want it there if you're trying to learn to play this way. Also, wash your hands before you play and clean your instrument! The thumb needs to be able to slide along the neck freely. While the hold is the same for viola players, we also thought it might be easier to start out with a violin. It's lighter, your arm is less extended, and the distances are shorter. When you're above 4th position, your wrist is against the bout, so the palm is holding the instrument in place, but from 4th position downward is venturing out "onto the diving board", so a smaller distance to bridge might be useful in the beginning. Really debatable observations, but why not while we're at it? : While more difficult in the beginning, I think this sort of technique produces a different kind of sound, especially regarding slides. It's my opinion that Mr. Vardi's "swanky, elastic" slides sound so unique because of his technique. While they might be able to be reproduced with a shoulder rest, I feel it wouldn't necessarily be a natural technique to arrive at. The physical benefits of playing without shoulder contact are the freedom to put the scroll wherever you need (useful if you're crammed into a small opera pit!) as well as less wear and tear on the back. A more debatable point, I feel it keeps the left hand in a better position from the start, as there isn't the freedom to have a bad position and be able to play. For more reading, see Leopold Auer's book on the playing the violin (Violin Playing As I Teach It). He advocates this method. Also, many videos exist at YouTube of Nathan Milstein, who held the violin this way, with cameras from all angles. In the beginning you think it seems impossible, as if the violin will fall, but with the right movements (different from what you may be used to), it can be accomplished! March 13, 2018 at 10:54 PM · I often forget shoulder rests even exist, but hadn't considered a good reason to go without is to avoid contact between shoulder and instrument. I just do it to imitate the way violin was played in the 17th and 18th centuries, when the music I play was composed. I also removed the chinrests from my violins. There are times when I have trouble keeping the instrument stable, but usually I do just fine. It seems to matter which shirt I wear, as thick low collars or sweatshirt chords destabilize it. March 13, 2018 at 11:24 PM · Shoulder rests, most of the times, are an illusion of confort and security. They create a terible static violin position. They hide problems with left shoulder lifting since that a tense shoulder can be seen as in normal position because it is apparently down when, in fact, we can be forcing it against the shoulder rest that doesn t allow it to be seen as lifted. Shoulder rests also provide a quick solution for basic violin mechanics: violin hold, left finger action and shifting are learnt without proper relaxation. Playing without demands greater understanding of the body and the instrument . March 14, 2018 at 12:55 AM · Cool article. A controversial issue indeed, but here's my personal opinion. While I agree that shoulder rests stabalize a violin and the decision to use one or not is very personal, there are ways to be ultra-relaxed even with a SR. Thing is, though, some physiques are more suitable for restless playing than others. If you're going to go shoulder restless, you might need a higher chin rest. I play with a shoulder rest, though I have briefly tried playing without one, only because it was too inconvenient having to put one on, especially when trying out violins (have to constantly switch between violins) or if I'm in a rush to play for a brief period of time. I've been fairly successful, at least in my owo opinion, except that my scroll drops more often. I'm going to get a viola soon, and have thought about going restless for viola only if necessary because I fear it may not fit under my chin with a shoulder rest on (won't know before I try). It's not like I have a super short neck or anything. March 15, 2018 at 03:33 PM · This is a very interesting subject. I have gone back and forth between a rest and no rest and several different types of rests. In the beginning I didn't ask questions. I just put the rest on a did the best I could because this is how you do it. Later on I began to notice a few players who I really admire not using rests. Some of them only use a sponge pad with a rubber band holding it on. I began to experiment and showed up at a few lessons with no rest. My teacher noticed it and told me to put it back on again, so I did. I am really torn on this issue because it somehow feels more natural not to use a rest, yet if I don't use a rest I am concerned I might be picking up bad habits. There is also some debate on the sound of the instrument without a rest. Some say it slightly affects the sound. "I feel it keeps the left hand in a better position from the start, as there isn't the freedom to have a bad position and be able to play." This is absolutely true--you literally cannot play anything beyond the most elementary level with bad habits when you aren't using a shoulder rest. Why? You can't shift up and shift back if you have bad left hand position or tension when you are using the left hand to help hold up the violin as a restless player does. Playing restless forces one to immediately correct several areas out of necessity, and when I switched I found it only took a few days to get used to the change--necessity focuses the mind consciously and unconsciously. Now, another reason I think restless playing is helpful that you didn't mention: the continuous contact required to hold the violin up also helps to orient the hand when shifting and makes shifting to the right notes easier. As Galamian says in his book, the subtle changes in the width of the neck are a guide when shifting, and when you are playing restless you are always in touch with this guide. A player with a rest often hops around, as you said, and in doing so many lose their feel on the finger board and thus a sense of the location, causing them to miss a shift or at the very least making shifting much harder. Playing restless is fundamentally better for all the reasons you stated, plus those the great masters of the past have also written of--and we are still only talking about technique and not even tone, and a rest definitely does mute the resonance of a violin as anyone can test by playing with and without a rest and noticing the differences in the volume of the overtones. I encourage everyone to try playing restless, and if they have long necks to get a taller chin rest, which is the proper solution, instead of using the easier to install but worse in every other way SR.
March 16, 2018 at 12:58 PM · Jason, thanks! And I agree with your added point about continuous contact being helpful at getting to know the fingerboard better. It's what I was trying to get at when I wrote about having to use a little more pressure and shift more slowly, but you expressed the idea better than I did! You need to feel the length of the string as you go and not hop around. Timothy, if you can play well and not use a rest (and not raise your shoulder), I'd say you've likely avoided many bad habits. On the other hand, if your teacher is successful in playing a certain way and not comfortable with you trying to play differently, you might stick with your teacher's advice for now. It's perfectly possible to play very well and not be familiar with all the ins and outs of playing restless, and if he or she isn't comfortable giving you advice in that area, I wouldn't choose that particular topic to study with him/her in lessons. You can always keep it in mind for down the road! Ella, many good points! I agree it's possible to play in a relaxed or tense way no matter which technique you use. I think tension and doing things the wrong way will show up more without the rest. A rest can sort of mask some of these things and still allow you to get around. But it certainly is possible to play very well with a rest! And Will, yes, the vast majority of our repertoire was written before the invention of the shoulder rest (mid 20th century) and even the chin rest (mid 19th century.) I like the chin rest though because it keeps sweat from discoloring the varnish. March 17, 2018 at 12:24 AM · Personally, I have tried out both ways and have realized that I use a Wolf shoulder rest but I really don’t have it “hold” the violin at all. It’s just convenient to use as it is very light and helps when you’re tuning and occasionally needing a place for the instrument to rest in between playing. I carefully studied the Paul Rolland book—The Teaching of Action in String Playing, and Professor Rolland had remarkable results and did not advocate a shoulder rest even for young children. He had students use a small cosmetic sponge so there is no slippage. I find that the Suzuki method way of teaching the violin hold, by holding without the left hand, and holding between shoulder and chin, to be quite risky as it sets the student up for possible neck and shoulder tension. 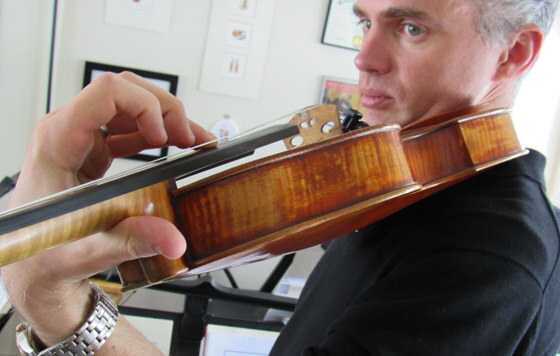 The violin should always be balanced between the left hand and the collarbone, coupled with the correct motion patterns for shifting and finger articulation—no static postures should be part of early Violin hold training. March 17, 2018 at 12:41 AM · I'm old enough (just!) to remember when SRs started to come on the scene in the early 1950s. I was a young cellist then, playing in the school orchestra and later in a regional youth orchestra. I still remember the day when two of the 1st violinists turned up to the first rehearsal of term with SRs, and the conductor asking "what on earth are those contraptions?". He, the head of music, had evidently not seen a shoulder rest before, or perhaps even heard of it. A year down the line and every violinist and violist in the orchestra had a SR, which goes to show the power of advertising and a handful of influential teachers jumping on the band wagon. I remained an active amateur orchestral cellist until fairly recently, but shortly after I retired from my full-time job I took up the violin, which now replaces the cello in my orchestral playing. An old family violin - quite a good instrument - had been bequeathed to me so thought I had better do something about it. Since it hadn't been played for 50 years or more needed a luthier's attention was needed before it was decently playable, so when I collected it from him I bought a shoulder rest without thinking - hey, every violinist and violist in my orchestras used one, so it was the obvious add-on to have. I started having violin lessons from quite a good teacher, but when I went on holiday in Ireland to attend a folk music summer school two years into lessons I noticed that most of the tutors there and some of the more advanced didn't use SRs. That got me thinking back to my school days and the advent of SRs, and how did they hold the violin before then? When I got back to England I did a bit of research, looking at old photos and the occasional video, especially of Baroque ensembles, on the internet of great violinists of the pre-SR era, and stopped using my shoulder rest immediately. It took me only a few days to get used to its absence, and haven't used one since. My teacher, who herself used a SR, noticed of course, but raised no objection. In fact, rather the opposite; she took it as an opportunity to concentrate even more on a relaxed stance and hold, with resulting benefits in the LH hold and the bowing arm. All this has apparently significantly helped my fingers' unconscious "knowledge" of the fingerboard, as Jason has pointed out. I just don't have to think where the notes are now. As a test, today I looked at that notorious "four Fs" thing in the Bazzini Rondo des Lutins (a piece that I haven't otherwise worked on) and to my delight those four Fs came out perfectly in their right places at a reasonable speed. And the same for the four F#s. Since September of last year I started playing without a chin rest. This works for me because I don't have a long neck. All I need to do in down shifts is to apply just enough downward contact (rather than pressure) with my jaw on the violin so that I have just that little more friction between my jaw and the body of the violin, and partly on the tailpiece perhaps, than that of my left hand sliding down the neck. It's essential of course to keep the violin horizontal and to rest the violin on the collar bone - that stops gravity from making a nuisance of itself. One fairly obvious effect of removing the chin rest is that the natural resonance of the instrument is now unimpeded, possibly even more so than just by removing the shoulder rest. There is an Italian Baroque violinist, Enrico Onofri, who doesn't use a chin rest, and of course no shoulder rest, but holds his violin in place by an aviator's white silk scarf passed through the gap between tailpiece and violin and then round his neck where it is secured by a simple knot. See videos of him on YouTube. He has been using this system for many years, but he is a soloist, so it makes sense for him. I don't think it would be quite so useful in an orchestral environment where the instrument is being put down and picked up a lot. The chin rests for both my violins are now put away in a box somewhere in the attic - I'll probably forget where they are one day - but I'm keeping them just in case my daughter in Belgium, who is learning the violin visits and wants to do some practice. But I have no SR for her, and she knows that. March 17, 2018 at 12:52 AM · Interesting article. I am coming at it from the point of view of a player/teacher turned violin maker, and am wondering about the pressure that the 'restless' technique described in the article might put on the instrument in three areas - the neck joint, the lower back arching (where the instrument will inevitably have contact with the body) and the centre bottom belly. Specifically you describe resting the chin on the tailpiece rather than the chin rest. Not a good idea for the instrument or set up. Also, you describe in point 1 that the thumb and index finger rest against the scroll. You mean the neck, I am sure. Two last points - not everyone who uses a shoulder rest has the technique described. I was taught to balance the weight of the violin between the head/collarbone and the left hand. This prevents tension in the neck and encourages good left hand shape and position. Finally. There are now some excellent shoulder rests on the market that are designed to enhance rather than mute the sound, such as the KorfkerRest. Hope my thoughts are helpful to some people. March 17, 2018 at 09:00 AM · I attach a very small felt strip to the metal bottom of the chin rest clamp. This stops the metal rubbing against my collarbone. I am not advocating an ideological position here: just a suggestion if you want to play rest-less as I have for several years. I never get neck or shoulder now from playing. March 17, 2018 at 07:30 PM · To the anonymous comment above (51.9.66.26. ): Thanks for the correction. Yes, I meant to write "neck" and not "scroll" and have now edited it to make for easier reading. As far as keeping the chin in the middle of the instrument, many chin rests go over the tail piece. That's what I was referring to. Trevor: Thanks for your comment-- it is amazing how things can change so quickly. I see more and more people playing restless these days than when I was a kid, so the pendulum may be swinging back a little! March 17, 2018 at 07:33 PM · The violin is superbly designed to make the maximum sound possible with the natural materials available. And you dampen it py pressing it against your clothing????? Are you NUTS????!!!! March 17, 2018 at 08:37 PM · Very interesting. For the first 30 years of my playing I didn't use a SR. Then I had a bicycling accident where I broke off about two inches of the distal end of my left clavicle and dislocated the proximal end. The surgeon told me that given the nature and position of the break putting it back together wasn't going to work and the dislocation could never be a permanent fix - a good jolt would cause it to dislocate again. Once everything healed I tried playing and it hurt a lot. The SR allows me to play now. No it isn't perfect but its better than not playing at all. In the end they are a tool that some need and others don't.